What Is The Meaning Of Christianity? I will try not to go metaphysical in explaining Christianity. Christianity is meant to give personal assurance of being accepted by God while giving the power to live with confidence to serve God and man in a God-honoring way. The personal nature of Christianity creates a transformation that can be seen in every public relationship. And this is why the practice of true Christianity is meant to influence every sphere of human interaction. If you are like most people, you want to be able to explain why some things happen. And it was no different in the past. Early Christians reflected their faith in their relationships and it influenced their behavior. Centuries later, these behaviors were codified and became the source of writing the laws in most western countries. But as years rolled on, the tyranny of men who were profiting on others using organized religion made most western countries throw out Christianity. This is why some think that Christianity has failed. Christianity has been mixed with religion, politics or economics. And this has left people with a poor view of it. I have had the opportunity of visiting countries in the west and made some interesting discovery. Despite the overt disinterest in Christianity, there is an embrace of behaviors that Christianity stands for. A lot of this is down to the carry-over from days when Christian behavior formed the basis for developing the law. The practice of protecting and providing for the least of society: these are Christian principles at work. People have adopted the Christian lifestyle without embracing the Christian faith. A country may not be Christian but God will bless it for practicing charity, serving its people in justice and defending the interests of the vulnerable. God will bless countries because of the good found in them. It’s a bit like the story of Sodom and Gomorrah. Ten men doing “good” in it could have done the trick and guaranteed its survival. The city was not destroyed because of only the bad men in it. It was destroyed because of having less than ten good men in it. One of the things that happen when people hear stuff like this, they come up with an exception. So, I bet you are probably thinking “there are countries that are bad but still enjoy prosperity, so what do I have to say about that?”. Well, I have an example to work with from Bible. Let’s look at the Canaanites. In Gen 13:14-17, God promises the land of Canaan to Abraham. Yet, He did not give him the order to clear out the current inhabitants. According to God, He would let the current inhabitants stay there for 400 more years so they could be as “big and bad” as they wanted. (Gen 15:12-16). It seems that God gave the land to the Canaanites but because of their sin, He was taking them out. But He would still give them time to get their act together or become as “big and bad” as they could. By the way, God even gave them 30 years extra before deciding to move out the Israelites from Egypt. (Ex 12:40,41). They even got another 40 years extra because God punished the Israelites by having them wander in the wilderness for their lack of faith in Him. Just think of that – the Canaanites that God had given a wipe-out order on were living large and enjoying good times all through these years. Don’t worry if the bad guys are having an open-house party, God will still come for them. 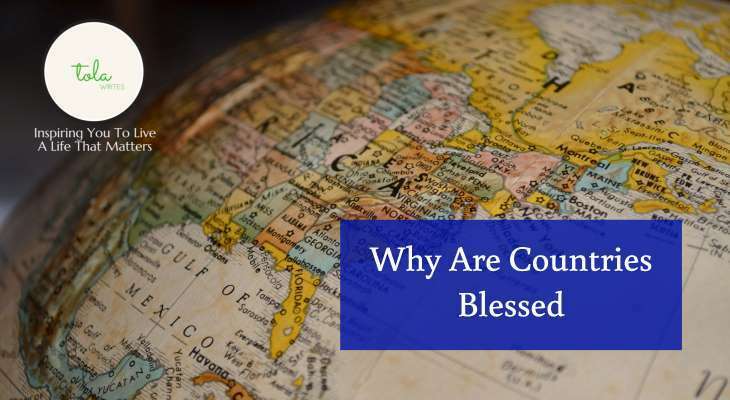 God blesses countries because of the good He sees in them. And Christianity, when lived right, brings the greatest good to countries. God may bless unchristian countries if they govern based on principles that align with the Christian lifestyle. The Christian lifestyle is founded on justice, truth, love, and righteousness. Countries that claim to be Christian and do not live by these principles are lining themselves up for an end-of-civilization event. It may take time but it’s bound to happen. So, I don’t think Christianity fails countries – it’s the countries that failed it. Christianity is not irrelevant in the new century. The value of Christianity in countries of the world should be in the quality of relationships that Christians live out and how they work to add value to their countries. It is in our hands to restore its lost glory. Our attitudes as Christians is to show the benevolence of God. This is a wake up call to me personally to check my life whether it’s encouraging others to make a decision for Christ or to ask to be excused.